Steve Noble, snare and bass drums, cymbals; John Edwards, double bass; Alan Wilkinson, alto and baritone saxophone, voice. 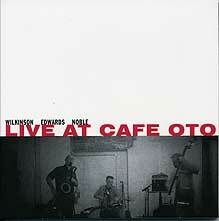 Recorded 11 July 2008 at Cafe Oto, London. Photograph (front cover reproduced above) by Midori Ogata.